55-2974 air-to-air shot with 55-2976 (49) and 55-2977 (50). • 55-2974 US Army. Delivered 28-Feb-1955 to the 521st Engineer Company at Crissy AAF, San Francisco, CA. Accident: Fort Carson, CO. 16-Jun-1959. While engaged in a troop transport flight, the aircraft crashed in a ravine near Fort Carson. It came to rest inverted and sustained major damage. The pilot and nine passengers survived the crash, with some injuries. The Otter was a write off and was deleted from the Army inventory in October 1959. An alternative report Accident 04-Jan-1960. Gulf of Sirte, Libya. The Otter was flying from Wheelus Air Base to Benghazi with two en-route stops, returning surveyors to field locations. The Otter disappeared over the Gulf of Sirte and was never found. The aircraft was carrying one crew member and nine passengers. Otter 47 was one of a batch of six Otters delivered to the US Army. Its delivery date was 28 February 1955 and it was allocated serial 55-2974 (tail number 52974). These six Otters were an “off-the-shelf” purchase of aircraft which were urgently required for a survey of Alaska. It had originally been intended to designate the Otter in Army service as the C-137 and these six Otters actually carried the C-137 designation on their Technical Data Blocks when delivered, the only Army Otters to do so. 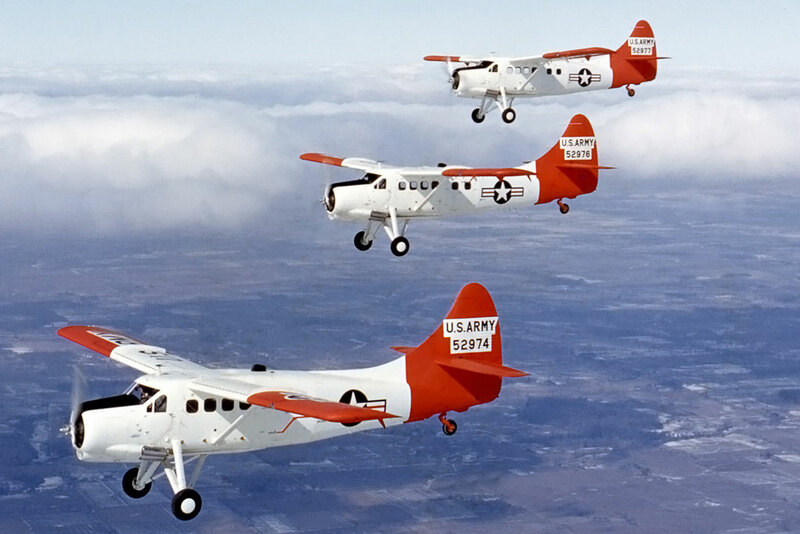 They were in fact designated YU-1-DH and all six were painted white overall with arctic red tail and wings. On 28 February 1955 there was an official ceremony at Downsview when the aircraft were handed over to the Army and all six then set off together on their delivery flight to their unit, the 521st Engineer Company, part of the 30th Engineer Group. The six Otters flew across the country to their new base at Crissy Army Air Field (AAF), San Francisco at the water’s edge near the south side of the Golden Gate Bridge. After a period of training and familiarisation at Crissy AAF, the six Otters were flown to Alaska in two flights of three in April 1955, routing first to Idaho Falls, then Great Falls, Montana-Edmonton, Alberta – Whitehorse, Yukon then to Ladd Field, Fairbanks, Alaska. Throughout the summer and autumn of 1955 52974 and the other five Otters operated on floats north of the Brooks Range, supporting the survey work. Main base was at Umiat, with a secondary base at Kotzebue. As well as mapping and photographic work, the Otters were used to resupply the field parties who were working with their helicopters out in the bush. At the end of September 1955 the Otters made the long return flight back to Crissy AAF., San Francisco. The following month the 521st Engineer Company relocated to the Sharpe General Depot at Stockton, California. That winter the six Otters took part in various evaluation exercises and during 1956 were used for survey work in the deserts of Arizona, California and Nevada. The operations of the 521st Engineer Company were scaled down during 1957, as its tasks were completed and the unit was formally inactivated on 24 June 1958, the Otters being assigned to other units. 52974 was assigned to Fort Carson, Colorado based at Butts AAF, high in the Rocky Mountains. On 16 June 1959 it took off from Butts AAF., with a pilot in the left seat, combat scout leader in the right seat and eight combat-equipped troops in the cabin, on what was sadly to be its last flight. Following take off, at about 25 feet, the Otter began to settle back towards the ground. The pilot, attempting to maintain flying speed, initiated a descent into an adjoining canyon in order to avoid striking rough terrain directly off the end of the runway. During this descent, the left horizontal stabiliser struck the trunk of a dead tree. The aircraft struck the side of the slope of the canyon in extremely rugged terrain, impacting on its left wing, nose and left side, rolling to a partially inverted position before coming to rest sixty feet beyond the point of initial impact, at a point five miles south south west of Fort Carson. The cockpit and cabin remained reasonably intact, although very battered. There was severe damage to the wings, engine and undercarriage. The pilot and combat scout leader escaped through the broken front windshield. Seven cabin passengers evacuated through the left main door, which had been torn free. The remaining passenger in the cabin required assistance to exit the cabin. Many in the cabin had been drenched by gasoline pouring from ruptured fuel tanks, although thankfully there was no fire. Some of the occupants escaped with only minor injuries, while some suffered more severe injuries due to the failure of seat attachment points and seat belts. The Otter itself was a write off and was deleted from the Army inventory in October 1959.